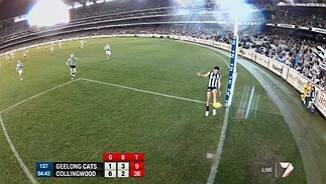 Selwood's goal, or did Sidebottom get a touch? The final siren sounds with Collingwood running out 31 point winners over a disappointing Geelong. GOAL CATSSheringham kicks long and it just manages to clear them all for a late goal to the Cats. BEHIND MAGPIESCloke marks 20 metres out and will line it up for his second. It's a poor kick at goal and he looks to be a frustrated player. GOAL MAGPIESFasolo marks in flight and is pushed to the ground. The 50 metre penalty is paid and Fasolo kicks it from the goal square. GOAL CATSMotlop handballs to himself and shakes off Sinclair. He runs in and kicks it along the ground for a goal. BEHIND CATSSelwood runs in 35 metres out, but he misses to the right and the Magpies fans cheer as one. BEHIND CATSSmedts marks it in the pocket but he misses to the near side. O'Brien takes on and beats Chapman in a foot race and he even takes a bounce for added measure. GOAL MAGPIESPendlebury gets it over to Cloke who kicks it across his body for a goal. BEHIND CATSWalker throws it on the boot under pressure, but the bounce is not good and it's only a behind. GOAL CATSJohnson with a defence splitting pass that sets up Selwood with a shot at goal 20 metres out directly in front. 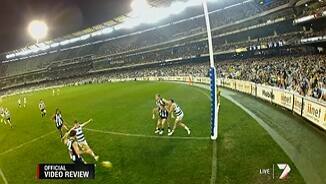 Selwood doesn't miss. BEHIND CATSWest is front and centre outside 50. He takes it and goes long, but misses to the left. GOAL CATSHawkins marks 45 metres out on a 45 degree angle. His kick looks good off the boot and the goal umpire does not move. Collingwood by 48 points at three quarter time. Cats make their substitution with Sheringham coming on for Stokes. GOAL CATSWest marks 50 metres out near the boundary and his kick is a beauty. Cats trail by 48 points. BEHIND CATSTaylor goes long from outside 50, but it's off hands for a behind. BEHIND CATSThe Collingwood defence concede a rushed behind. GOAL MAGPIESCollingwood go from coast to coast with Fasolo kicking it to Beams in the square. Beams marks and kicks it 30 rows back. BEHIND CATSReid kicks it through for a rushed behind. GOAL MAGPIESTarrant turns back the clock to take a big grab in the forward line. From 20 metres out he has no problem converting. GOAL MAGPIESGoldsack is front and centre in the marking contest. He handballs to Dawes who snaps it through for his second. Collingwood on fire! Hot Pies! Geelong are not making the required inroads into this Collingwood margin and each minute that ticks by is crucial to the hopes of the Cats. BEHIND CATSHawkins is not having a good night in front of the sticks. Another mark goes unrewarded with Hawkins missing to the right. GOAL MAGPIESElliott leaps but is unable to bring it down. Cue Daisy Thomas front and centre and like a true rover, Thomas takes the crumbs and snaps it through. Collingwood by 40 points. GOAL CATSChapman marks running with the flight of the ball and he slots it through for another Geelong goal. BEHIND MAGPIESThis time the Cats defenders return the favour and rush it through for a behind. BEHIND CATSSelwood claims the goal whilst Sidebottom claims to have kicked it through. In th end the video review gets it right and it's a rushed behind. 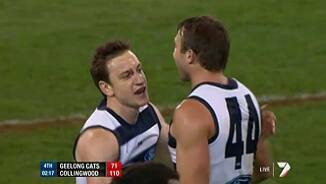 GOAL CATSChapman passes short to Selwood who takes the mark. From 45 metres out it looks good and Geelong get off to a good start. Collingwood have activated their sub with Buckley making way for Clarke. The siren sounds for halftime and it's all Collingwood at the moment. They lead by 46 points and are looking the goods for the 4 points. BEHIND CATSEnright marks and plays on, but his shot from the 50 misses to the right. Geelong really need to do something before halftime. GOAL MAGPIESPendlebury handballs to Shaw who passes it to Dawes and he takes it on his knees. Dawes needs a confidence booster and he drills it. Great kick. BEHIND MAGPIESPendlebury sells some candy and gets around to kick, but it misses to the left. 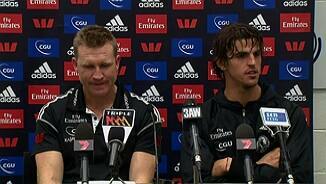 GOAL MAGPIESFasolo marks it on his chest and withstands Corey's efforts to spoil. His shot from 40 metres out is a beauty. Collingwood by 40 and cruising. BEHIND CATSHawkins marks 45 metres out. He rushes the kick and it's lucky to sneak in for a behind. 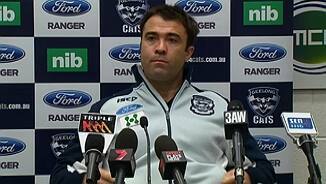 Geelong need to figure out a way to get back into this match. Collingwood seem to have it under control. BEHIND MAGPIESScarlett rushes it through for a Collingwood behind. BEHIND MAGPIESThe Geelong defence scramble the ball through for a rushed behind. GOAL CATSJohnson with a brilliant set up kick allowing Motlop to run onto it and take the mark. From point blank range Motlop kicks a much needed goal for the Cats. Joel Corey has been reported for a sling tackle. The Collingwood defence rush it through under pressure. BEHIND MAGPIESTarrant creates an opportunity out of nothing but he hits the post. GOAL MAGPIESGoldsack runs onto the loose ball. He turns with the precision of a dancer and kicks a magnificent goal. Collingwood by 39 points. BEHIND CATSJohnson is paid the free kick for being ridden into the ground. He kicks a banana kick where a drop punt would have been more appropriate and it bends away. Collingwood lead by 34 points at quarter time. GOAL MAGPIESJolly kicks a goal after the siren after being paid the free kick for high contact. BEHIND CATSWalker marks Johnson's good across the body pass. However, his kicking doesn't appear to be one of his strengths. GOAL CATSMackie kicks to the 50 where West takes the mark. From 55 metres out West's kick is straight but does it have the carry? YES IT DOES! GOAL MAGPIESJolly handballs inside to Thomas who sizes up the situation and finishes off the job from 20 metres out. Everything going Collingwood's way. GOAL MAGPIESTarrant gets the bouncing ball before it crosses the line for a behind. He balances then walks over to the goal square and kicks it 33 rows back. 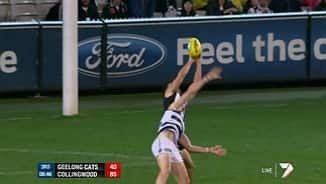 If Geelong can get closer in terms of scoring, the contest for the ball is even and this could have the makings of a classic. BEHIND CATSHawkins is held without it and is paid the free kick. He hooks it and it's a shocking kick. Just sneaks in for a behind from 45 metres out. GOAL MAGPIESPendlebury handballs to Sinclair who goes inside to Beams who knows where the goals are. Under pressure his snap was brilliant. Just Brilliant. BEHIND CATSWalker rushes out to take the mark after taking the centre bounce. From 40 metres out the first gamer misses to the right. GOAL MAGPIESCollingwood are on fire! Maxwell is awarded the 50 metre penalty for an infringement on the mark and he slots it through from 30 metres out. The Cats are rattled at the moment. They are playing undisciplined footy and turning it over at will. BEHIND MAGPIESThomas from the boundary kicks it across the face and it's through for a behind. GOAL MAGPIESSwan kicks long to Elliott one on one and he takes a strong mark. Elliott kicks it and Collingwood leads by 18 points. GOAL MAGPIESExcellent defensive pressure inside attacking 50 brings the ball out. Goldsack pounces and kicks before he is tackled. The ball bounces through for a goal. GOAL MAGPIESThomas marks it 35 metres out. He brings the kick back from right to left and the Magpies are on the board. BEHIND MAGPIESTarrant uses his strength to outmark Motlop but he is a little rusty in front of goals and he sprays the kick. BEHIND CATSHawkins comes out strong on the lead and marks. From 40 metres out he hits the post. Welcome to the MCG where the biggest match of Round 16 will be played. It's Geelong v Collingwood on Saturday Night Football. The subs have been named with Sheringham and Clarke wearing the yellow vests.